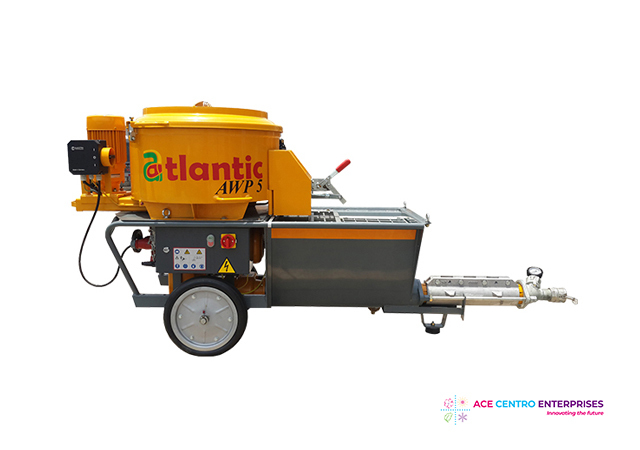 Atlantic launches its new Cementitious Fireproofing/Plastering Machine AWP 5. It comes with a 2L6 Worm Pump which can handle a number of different materials like pre-mixed plasters, fireproofing materials, acoustic, fiber glassed reinforced materials and many more. The modular system is suitable for spray pumpable wet mortars with grain size of up to 4 mm and it’s easy to use features makes operation on site simple and and economical. With a variable output, from approx. 7 - 40 l/min, the AWP 5 can be adjusted to any type of application. Geared Motor with safety lock ( no unintentional speed change ). Plug & Play ! Machine comes complete with mortar hose, air hose, spray gun, nozzle and remote control. Lifting eyes - Easy to move the machine to higher floors of a building using lifting equipment. Remote Control Cable - Allows for easy operation of the machine from a distance. Cam shaft controller - Helps in quicker mixing in the pan mixer while the pump is turned on.